1. Spray 9” Springform Pan with spray oil and place a round of parchment in the bottom of the pan and spray again and coat the bottom and sides with baking sugar, discarding excess. Set oven at 350 degrees. 2. Whip egg whites with salt & cream of tartar until stiff and set aside. Whip together sugar and lemon olive oil until fluffy and well blended. Add sour cream, lemon juice and zest and the extracts, beat until smooth and well combined, about 2 minutes. Whip in egg yolks one at a time beating well after each addition. 3. In a separate bowl whisk together almond meal, baking soda, baking powder and salt, then add to wet ingredients 1/3 at a time, mixing in throughly after each addition. Fold in the whipped egg whites 1/3 at a time mixing in until no egg white is visible. Pour into prepared pan 3/4 of the way, there may be batter leftover. I make a 6 inch ramekin, prepared the same as the springform. Top batter with sliced almonds and the raw sugar. Place on cookie sheet and bake for 15-20 minutes or until cake is pulling away from sides and is golden and not jiggly in the center. It should test clean with a toothpick. Let cool on rack for 15 minutes, loosen sides and let cool completely. 4. Meanwhile prepare the Cherry Lemon Sauce. Mix all ingredients in small sauce pan and simmer over medium low heat for 5-7 minutes until fruit softens and release juices. Cool. 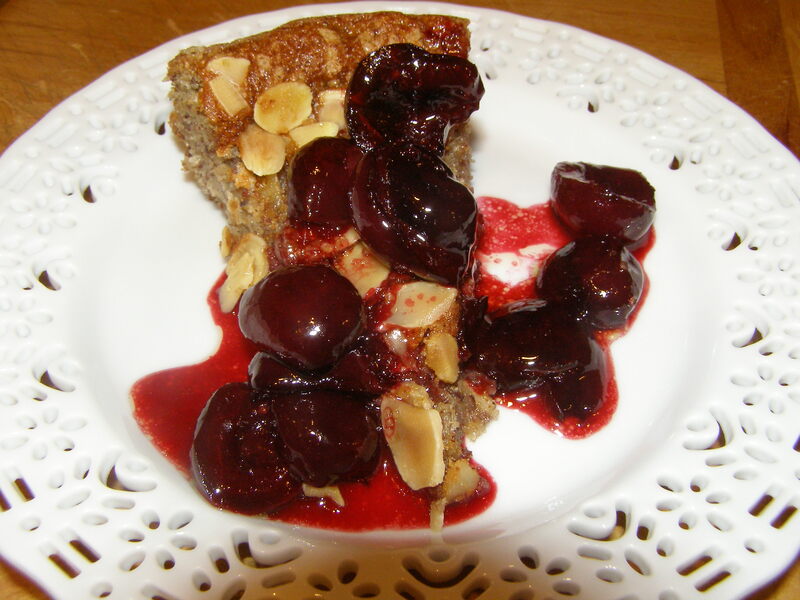 To serve slice into small slices as cake is very dense and top with cherry sauce. Option – serve with either Vanilla Ice Cream or Almond Whip Cream(optional) topping with the sauce.